Pure Power. Pure Strength. Pure Animal Intensity! For hard-core bodybuilders and strength athletes, nothing beats Animal Pak for maximizing gains in muscle mass, strength and performance. There is no better nutritional weapon available to fuel intense workouts. Spawning many imitators, the original Animal Pak is still loaded with the most advanced, highest quality bodybuilding nutrients. Each Pak contains a powerful combination of cutting-edge mega-cycle vitamin & mineral complexes, performance enhancers, lipotropics, digestive enzymes and high potency energizers. Animal Pak consists of a perfectly balanced, time-released formula that is easily assimilated by your body for perfect bioavailability and optimum performance. There can only be one animal in the gym. Make sure you train with it. The #1 selling training pak in the world for seventeen years straight. Since 1984, more competitive bodybuilders have cut their teeth on the Animal Pak than any other bodybuilding supplement in history. Why? Simple. Animal Pak gets the job done. It works. First time. Last time. Every time. Nature, in all her ingenuity, has designed the human body as the ultimate performance machine. Fact is, since the dawn of mankind, our bodies have changed very little. When it comes to feeding our muscles, we still need the nutrients we get from our diets. But when it comes time to grow our muscles in a freakish way, we need the right combination and mega-doses of essential amino acids, carbs, vitamins, minerals and essential fatty acids (EFAs). Only Animal Pak has what you need. You're the kind of primal beast who trains with Animal intensity. You need plenty of the above, plus that little something extra only Animal Pak provides. That's why we've also loaded the Animal Pak with performance optimizers such as PAK, IGF colostrum, nucleotides, lipotropics, L-arginine, Protogen A, eleuthero, and the like. In every pak, you're blasted with a dizzying array of over 55 key ingredients which are delivered in the right amounts at the right time, every time. Each of the 11 tablets included in each pak has been specifically formulated to deliver the goods. By taking the Animal Pak, you prevent the formation of nutritional gaps. Why should you care? The greater your training intensity, the faster and larger these gaps grow over time. When this happens you eventually hit a plateau. You stop growing. Maybe you've already hit this wall. To make matters worse, if you take other supplements, these same gaps begin to render those expensive supplements useless. Many of today's supplements rely on enzymes and other substances in your body to "activate" them. Nutrititional gaps mean these key activators may not function at all, so you may be wasting all of your hard-earned money on supplements that won't or can't work. Consider the Animal Pak as the cast iron skillet of your supplement program, your body's first line of defense. If you train with weights, then you absolutely need to train with the Animal Pak. Remember, while most supplements have come and gone, precious few have stood the test of time. When you're ready for the best, step up to the most trusted name in serious bodybuilding nutrition: Animal Pak. Why can't I just use a regular one-a-day type multivitamin? You can, but do you want to? Typical one-a-day type multis are made for Joe Couchpotato. They have 100% of the RDA in many vitamins and minerals. Listen, do you take 100% of the Daily Reference Value for protein which is 50 grams? No. You take more because you're a serious lifter. Serious lifters need protein. The same applies to your multi. Only Animal Pak was designed for the serious bodybuilder and strength athlete. Harder training athletes need more vitamins and minerals and other nutrients than sedentary individuals. So if your multi is one or two pills or even three pills, then it's time to consider what you're doing. Does Animal Pak contain any stimulants? No. 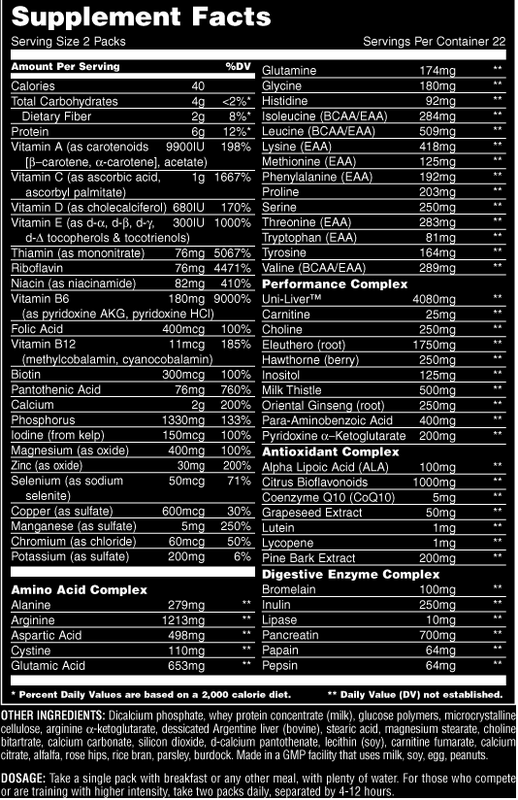 Animal Pak does not contain any ephedra, synephrine, caffeine or other stimulants. It only contains only natural energy boosters that have been shown to work. Do I have to take two packs a day? No. For the majority of lifters, one pack a day will do. Elite athletes (those preparing for a bodybuilding show or a powerlifting competition, for example) should take two packs daily. Is Animal Pak a multivitamin? Yes and no. One of it's component is a complete and comprehensive multivitamin that's true. In fact, as a multivitamin alone, nothing comes close to Animal Pak in terms of potency as explained above. That's why Animal Pak is the #1 selling training pack in the world. But Animal Pak isn't just a multi. It contains a range of essential and non-essential amino acids, digestive enzymes, electrolytes, antioxidants, lipotropics, and other nutrients to support lifters. Animal Pak is a complete "training" pack. Don't I get enough vitamins from my foods? Yeah, we all wish. Truth is, a lot of veggies, due to overfarming and poor soil quality, aren't as loaded in nutrients as they used to be. Plus, it assumes, you're eating a wide range of foods, including lots of leafy green veggies, fruits and other whole foods. You also gotta remember that even the pros, who eat right for a living, take a multi. And don't forget, when it comes to dieting, you're pretty much eating the same foods, day in and day out. Eating chicken, rice, turkey and tuna isn't a great diet from a nutritional point of view. It can quickly lead to nutrititional deficiencies and gaps. So whether you're bulking or cutting, a multivitamin like Animal Pak is absolutely essential if you want to stay on top of your game. Do I cycle the Pak? No. Because it has an important multivitamin component, you should take it every day. Animal Pak isn't the cheapest multi. Is it worth it? If you're going for the cheapest, then Animal Pak isn't for you. If you're not serious about training, then Animal Pak isn't for you. If you like shopping at the dollar store, then pick any daily multi. But if you want quality, then Animal Pak is the only choice. Most guys think they can skimp on the multi. They couldn't be more wrong. multi is probably the most important single supplement you can buy. So it makes sense to go with quality and a proven track record. That's why more IFBB Pros and Olympia competitors use Animal Pak than any other multi. That's why it's been rated as the best by athletes everywhere. That's why Animal Pak has been around for all these years. It flat out works. What more do you need to know? Oh yeah, Animal Pak is guaranteed, money back. Can I take Animal Pak with the other Animal products? Yes. That's what most lifters do. Animal Pak contains the basic nutrients your body needs. If you're body isn't running at peak levels, if it doesn't have all the vitamins and minerals it needs, the supplements you take may not work as effectively. Consider that. Why are there so many pills in Animal Pak? Listen, you can only squeeze so much into a single tab like you'd find in a regular multi. There's no way you could squeeze everything in Animal Pak into a single pill. Think about it. Animal Pak is a multivitamin. It's also an amino acid supplement. It's also an EFA supplement. It's a digestive aid supplement. It's a performance enhancing supplement. It's a ton of things all wrapped up into one pack. Directions: Advanced bodybuilders, powerlifters, and athletes, take one packet 30 minutes after the meal prior to your workout. For competitions and intense training sessions take two packets daily. Take with plenty of water. Warnings: Pregnant or lactating women should avoid use of this product. Please consult your physician prior to starting any exercise or nutrition program.